General Tray Deck Type VFD Front Display Touch Pad Control Buttons Audio Decoding Format Dolby Digital Audio Dolby Digital Plus Audio Dolby True HD Audio DTS Audio DTS HD High Resolution Audio DTS-HD Master Audio LPCM Audio AAC Audio MP3 Audio WMA Audio Connectivity HDMI CEC USB Playback Ethernet enabled Wirelass LAN Ready (Dongle Required) All Share (DLNA) Power Consumption Standby 0.8W / Operating 19W Power Consumption EnergyStar 2.0 Playable Disc Type Blu-ray Video DVD-Video / DVD±R / DVD±RW CD DA / CD-R / CD-RW VCD Audio Decording Output Dolby 2 Channel LPCM Output via HDMI DTS 2 Channel LPCM Output via HDMI AV input/output HDMI Output Composite Video Output Optical Digital Audio Output Analog (2ch) Audio Outputs Video Decoding Format MPEG 2 / 4 compatible DivX (including XVID) DivX HD AVCHD MKV WMV (1 / 2 / 3 / 7 / 9) JPEG / GIF / PNG HD JPEG Features BD Wise Auto Image Setup BD Profile 2.0 1080p DVD Output 3 Second Boot Time Full Screen capabilities Smart Hub Dimensions & Weight Product Weight: 1.7kg Product Dimensions: 433 x 39 x 205mm Description Enjoy smarter entertainment at Home For the ultimate home entertainment system, Samsung's D5300 Smart Blu-ray player is a must-have item. Features like Smart Hub unleash your TV's full potential, opening up a world of online content such as videos and music on demand. And you can forget wandering through websites to find entertainment - the new Search All feature uses your viewing habits to find you content and can also recommend new ideas. Samsung AllShare enables you to enjoy an expansive range of multimedia content by seamlessly sharing between other devices. The entertainment value is then given a new dimension with Samsung Apps, which will provide a whole new side of entertainment and communication for you to enjoy. An integrated Smart Hub brings a world of online content to your home entertainment system. Video and music on demand are all in easy reach. Forget wandering through websites to find entertainment - Search All uses your viewing habits to zoom you to the content you're seeking and to recommend new delights. Samsung AllShare enables you to enjoy an expansive range of multimedia content seamlessly shared between other devices. And Samsung Apps awaits to boost your experience further. Smart Hub Smart Hub brings a world of online content to your Blu-ray Player. You can access TV apps right from your couch, find and watch movies online with the touch of a button.Samsung Blu-ray Player will transform your TV viewing experience into a smart one. Samsung Apps Unleash the true potential of your Samsung Smart Blu-ray Player with Samsung's vast, and growing, library of Web-connected TV Apps. They provide you with a quick and easy way to access your favourite content--without ever turning on a PC. So you can download content that lets you access your favourite world of content (movies, music, social networking service) Search All Enjoy the ease of searching for information or content browsing through the convenient Search All feature in your Samsung Smart Blu-ray Player. With a couple clicks on your remote, you can quickly search for content related to the program you're watching or even access information and other features like VOD, Apps, and more. 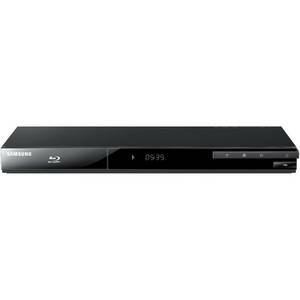 AllShare Share the content playing on your Samsung Smart Blu-ray Player with the built-in Easy to use feature. Using the Wi-Fi feature, movies, TV programs, or whatever you're watching on your Samsung Smart Blu-ray Player, can be seamlessly shared between DLNA certified devices, allowing you to enjoy an expansive range of multimedia content.